The first foreign aid to reach the site of the earthquake in Italy last week was an Israeli team of relief workers. Within two days of the tremors, IsraAID volunteer search and rescue teams were busy looking for trapped survivors and casualties. Other members of the team set up shelters and a feeding station. You might think it is no big deal. Italy is just a two hour flight from Ben Gurion airport. A quick international flight and then a slow ride up to the a spot close to the epicenter. Of course, the closer they got to where they were needed, the worse the roads. Some roads probably were totally destroyed. Still, the disaster was in Israel’s neighborhood. Sending aid to places hit by serious disasters is part of the Israeli culture. If local disaster relief services are overwhelmed, or likely to be overwhelmed, Israel will be there. Quickly. After an earthquake rocked Haiti in 2010, Israel sent two large airplanes of medical supplies and personnel. Within two days of the temblor, Israeli doctors were performing complex surgery in a state-of-the-art operating room in the military field hospital they had set up. A Zaka search and rescue team worked with Haitian teams to find trapped survivors while they were still alive. By the time they left Haiti, the Israelis had treated more 1100 patients. This included performing 319 successful surgeries, and delivering 16 babies. The first baby born there was named Israel by his grateful parents. Israel’s response to the 2011 earthquake and tsunami in Japan was similar. Members of the IDF medical corps and the Homefront Command set up and operated a field hospital. ,The hospital included maternity and pediatrics wards, ICU, medical laboratory, and pharmacy. 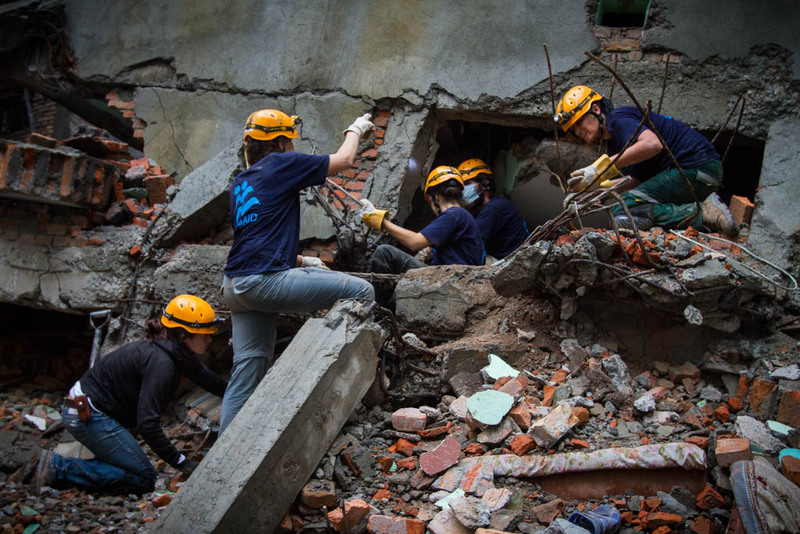 Volunteers from IsraAID and Zaka performed search and rescue operations. Israel even sent water experts to assist in rebuilding destroyed infrastructure. One of the reasons Israel responds so quickly, with such advanced support, is that its emergency response teams are always training and always on alert. As in the US, simulated emergency drills are regularly held. These may involve just one institution, such as a school, or they may be nation-wide. A simulation drill can teach you what to do and where to go, but often it is not taken seriously. Everyone knows it’s not for real. However, when you send a group out to an unknown place to deal with unknown injuries and dangers, there is an additional layer of anxiety. Putting a splint on an uninjured child’s leg in an intact school hallway is one thing. Putting that splint on the broken leg of a dirty terrified child in a pile of rubble which yesterday was his school is very different. People’s lives, including your own, are at stake. Israel understands on a fundamental level the importance of constantly training and using emergency skills. We sit on one of the most active faults in the world; we know that a disastrous earthquake is coming. It may be tomorrow, it may be next year, it may in 200 years. The rock under our feet will shift. Geologists monitoring the Syrian/African rift say that Israel experiences around 300 tremors every year. Most of them are too weak to be felt. However, about every 90 years, a severe upheaval occurs. We’re about due. The last big earthquake to hit the country, measuring 6.2 on the Richter scale, was in 1927 north of the Dead Sea. It destroyed numerous buildings throughout the country and caused many deaths. I’ve seen estimates as low as 192 casualties and as high as 900—no one seems to know for sure. That is out of a total population of less than 800,000. The 1927 earthquake also caused much damage in Jericho, Nablus, Tiberius, and Jerusalem. Rebuilding and repairs were undertaken fairly quickly, except in the Church of Holy Sepulcher in Jerusalem. Six major Christian groups had jurisdiction over holy sites within the church. Turf wars among them delayed repairs to some areas for more than thirty years. He seemed happy he would not have to explain the need for earthquake coverage to one of his clients that day. But I sometimes do need to explain. When we have guests and the talk turns to natural disasters, someone might say something about us not having to worry about earthquakes. Knowing the seismic history of the country, I have to control my urge to laugh. Instead, I mention some of the more famous quakes in our history. We have reports and evidence of numerous major earthquakes. Some scholars say that an earthquake was responsible for the stoppage of the flow of the Jordan River when Joshua led the Tribes of Israel into the Land of Canaan. The Jordan River has been blocked by other earthquakes. Following an earthquake in 1546, the Jordan stopped for up to three days. The contemporary reports sound like the Bible’s description of what happened more than three thousand years earlier. Josephus reported that an earthquake in 31 BCE caused serious damage and killed 30,000 people “and many animals.” The tremors affected an area in the Galilee south through Judea. He mentions Jericho, Qumran, and Masada. An earthquake in Beit S749 CE destroyed Beit Shean and Capernaum and damaged cities as far apart as Jerusalem and Tiberius. Additionally, this quake produced a tsunami in the Mediterranean and large waves in the Dead Sea. Tsfat (Safed) seems to be especially vulnerable to earthquake damage. Although the city itself dates to ancient times, almost no building there is more than two hundred years old. The 7.0 Richter Scale temblor in 1837 devastated the city and caused 4,000 deaths. Less than twenty years later, another quake destroyed Tiberius, only twelve miles away. Every time there is a bad earthquake anywhere in the world, our newspapers remind us of our own vulnerability. Although there are earthquake-proofing requirements in the building codes, the codes are much newer than many of our buildings. And we always wonder—how strictly did the builder adhere to the requirements? Did he take shortcuts that are unnoticeable until the building collapses under the stress of a shift in the nearest fault line? A government program gives a financial incentive for strengthening older buildings to make them better able to withstand earthquake damage. Under “Tama 38″contractors strengthen the buildings. Additionally, they add safe rooms and install elevators. They perform all the work at no cost to the apartment owners. Instead of payment, the contractors are given the right to build two or three additional floors on the building. They can then sell the new apartments, thus making a profit on the work. So far, only a few thousand buildings have participated in the program. Children practice earthquake drills in school almost as often as we had school fire drills growing up in the US. Some public buildings post notices of what to do in case of an earthquake, usually right next to the notices of what to do in case of rocket attack. Many of the rules differ, of course. In an earthquake you go to an open area outside, during a rocket attack you go to an underground shelter. But one guideline is the same in both instances—get as far away from glass windows as you can. So we sit here on the Syrian/African rift, waiting for the “Big One” to literally rock our world. We hope that when it does come, the epicenter will be in the desert. There, it will cause almost no damage, and be noticed by only a few gazelles and maybe some hikers. American Colony . Photo Dept, photographer. (1927) Palestine events. The earthquake of July 11, 1927. Wreckage of the Winter Palace Hotel, Jericho. A complete collapse . July. [Image] Retrieved from the Library of Congress, https://www.loc.gov/item/mpc2004004967/PP/.